Understand the role influence has in leadership and start expanding your influence today! Today we live in a world packed with social media, full of so called influencers, Youtubers, bloggers, digital nomads and online entrepreneurs. Even though influencing others and growing the list of followers is trendy nowadays, influence has always mattered greatly for those who want to lead others. Many individual contributors on their paths to people management roles don’t realize that they cannot lead people the way they used to manage projects or processes. That’s because you can’t simply manage people – you need to influence them. I believe that people should be promoted to people management roles only after there is a clear evidence that they have the capacity to lead others. How can this be gathered when they have no subordinates? As mentioned before, nowadays more than ever people can become leaders without having formal authority. How? Concentrating on their INFLUENCE! Merriam-Webster dictionary defines influence as “the power or capacity of causing an effect in indirect or intangible ways.” Recently I listened to Wanda Wallace’s podcast with Richard Shell, the author of the book “The Art of Woo” in which he very aptly defines influence as, “Anything you do, verbal, nonverbal, accidental, or on purpose that effects other people’s perceptions of you. And when you have influence, it generally means that you’re bringing a fair amount of credibility to the interchange.” By credibility he means how other people perceive your relevant authority, expertise, experience and trustworthiness. These definitions reveal two key aspects of influence – you need to be credible to effect others. No matter if you want to become an influential blogger, a CEO, or if you are on your way from an individual contributor to a management role, influencing how others perceive you and reinforcing that positive image and credibility will help you achieve your goals faster. You can be influential no matter what your formal role is. Do you know anybody in a formal or informal team who could be called an opinion maker? It is not for their voice being loud that they have such an influence on others. Acting in a way others desire to imitate or copy. This is how many people start their leadership careers – by being seen as influential throughout the company while still in individual contributor roles. Unfortunately, I started my blog on leadership because I have witnessed many organizations promoting people from within for their technical expertise and leaving them unsupported in leadership skills development until it was too late. A long time ago I used to work with a junior manager, Michelle, who always had her job done, had great organizational skills and technical expertise, and received excellent feedback on the results of her team, but she still could not make it to the next level in her career. You can read more about her in my article “Empower Yourself! Why Visibility Matters.“ Only when she started to build her influence across the organization, not only inside her own team, but cross-departmentally and with the executive team members, did she achieve her dream and was promoted to a higher level. But why does it matter so much to be influential as a leader and how does it go together with empowerment? One might think that if a leader is to empower others, he gives them “freedom to act,” which is in contradiction to influencing them to act or think in a certain way. So how can you be empowering and at the same time influencing others? And why should you? Sam was one of the senior managers in an organization with about a hundred employees, and almost everybody in the company had heard about him. Well, then you might think he had an influence on the organization. But no, he was only loud and visible. He was the one who talked the most during all meetings he joined. He was often fast in replying to questions others were asked without giving them a chance to reply for themselves. He was the one who started the organization and knew it the best. He was a true subject matter expert, but his problem was he behaved as he was the expert on everything and did not empower others at all. As the organization grew, he himself became its bottle-neck as he could not let his influence go. His influence changed into micromanagement, and the way he was perceived changed dramatically. Even though there are people who say that empowerment means giving up your influence to others, I believe that you cannot become a great leader without influencing others, and you cannot be a great leader without empowering them. No wonder that in the book “The 21 Irrefutable Laws of Leadership” by John C. Maxwell, the Law of Influence and the Law of Empowerment each has their own chapter as both are crucial. But how then, you ask, can I become influential? Ask somebody who is critical to your success to go to lunch with you, be it a senior staff member, somebody from another department, etc. Or, start networking in any way authentic to you, if eating or golfing together doesn’t work well for you. Make use of a good elevator pitch whenever you are in the elevator with anybody who might help you create an impact you want to make, be it a colleague from the office or a visitor from a different country. If you want to persuade somebody, use good, persuasive, and true stories and examples to support your ideas. Build your credibility based on your experience. If you want to sell your solution to a problem, try using the PCAN model Richard Shell presents in his book “The Art of Woo.” First, describe the Problem, then talk about Causes leading to it, then present your Answers, i.e. solution, to the problem, and finally discuss Net benefits of your solution, i.e. explain why your suggestion is the best one. You can use this model also for the elevator pitch. Build good relationships with others as your credibility and thus, your influence, is grounded in how they see you. Use empathy and emotional intelligence wisely to connect with others on a more personal level. Speak the language your communication partners understand to connect better – your CEO and your teenage child will probably be receptive to completely different language. Try to understand what needs, values, beliefs, and interests others have as this might help you not only build better relationships with them but also sell your ideas to them in the future. Empower others, show them that you don’t consider yourself to be the smartest person in the room. Care for others and not only for ideas you want to present to them. By expanding your influence, you can create a better and larger impact, initiate many positive changes, or even change the world. Start today, and see where it gets you. 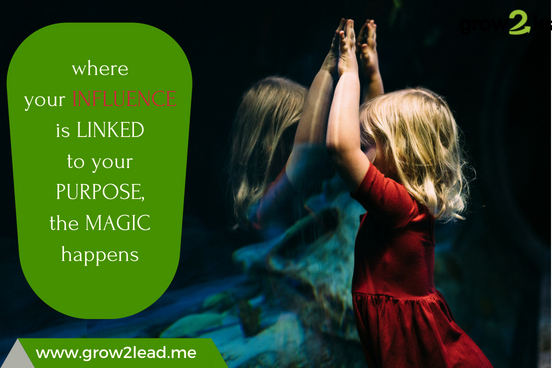 Bear in mind that where your influence is linked to your purpose, the magic happens.